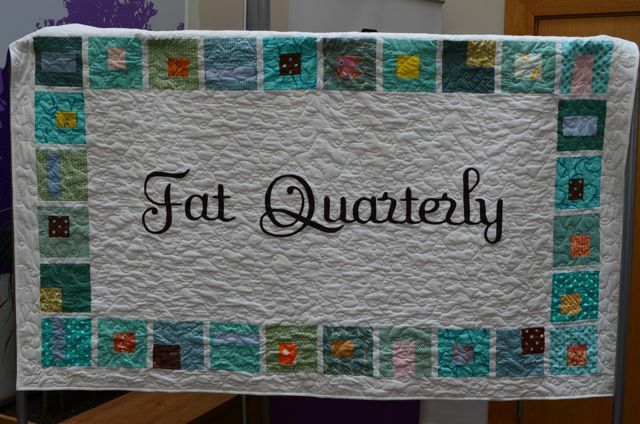 Fat Quarterly Retreat 2013 is almost upon us and I’m joining in with the linky party here. 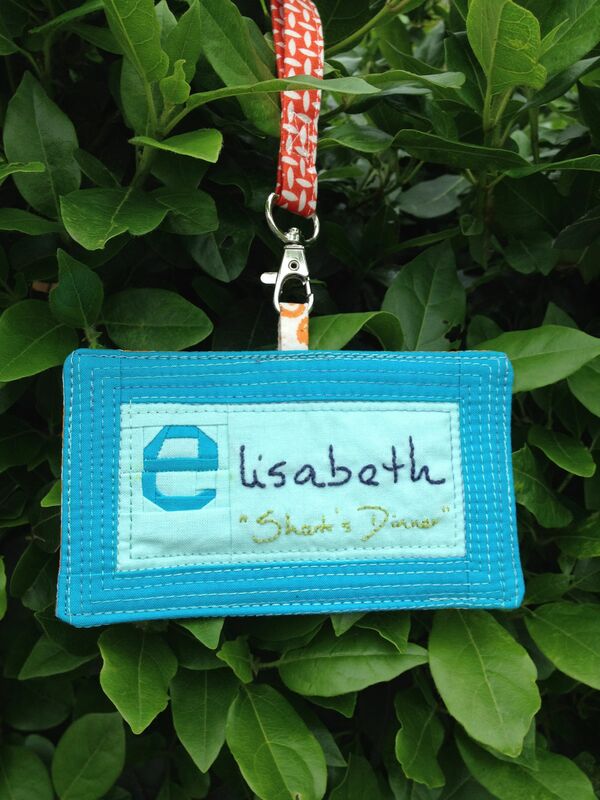 My fabulous name tag was made by the incredibly talented Leanne from She Can Quilt. She’s one of my quilting heroines so you can imagine how it feels to have a name tag made by her. That foundation paper pieced ‘e’ is 1″ square! 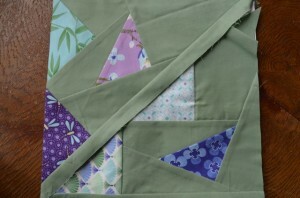 I’ve been sewing since I was a girl but only started quilting a couple of years ago. So far I’ve only made one quilt, although two are now ready to be basted and quilted in the next few days. 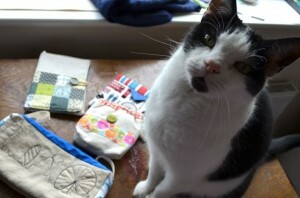 However, I have made quite a few mini quilts and cushion covers. 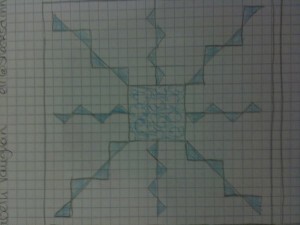 My favourite is hand sewing and I love drawing and sewing my own English Paper Piecing patterns. There are a couple of free patterns on the tutorials page if you are interested and I’m working on two more which will hopefully be added soon. 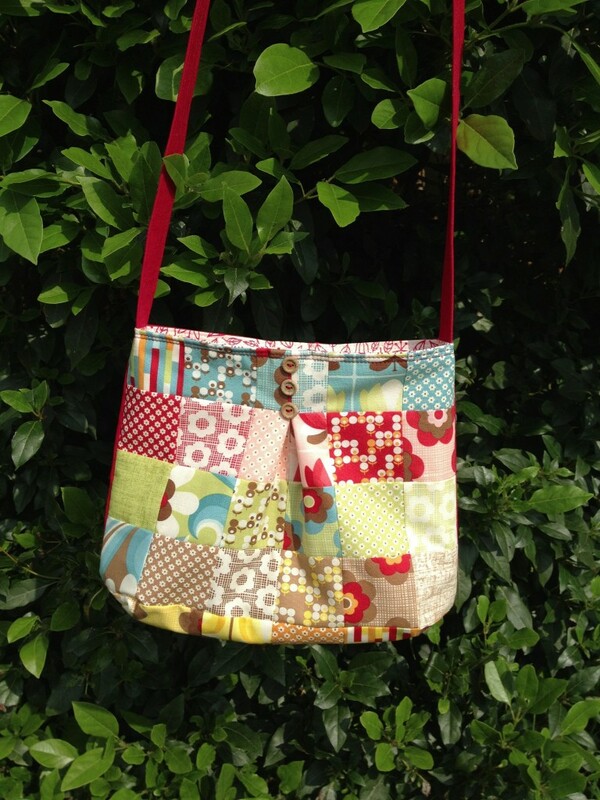 My classes are: Improv with Lu Summers, English Paper Piecing curves with Julianna and Joanna, Flexi purses with Tacha Bruecher and Hand Quilting with Mandy. I’ve got all my materials ready (except for quilting needles and embroidery floss) and have put my name on my mat, ruler and rotary cutter. Oh yes, I’m ready. 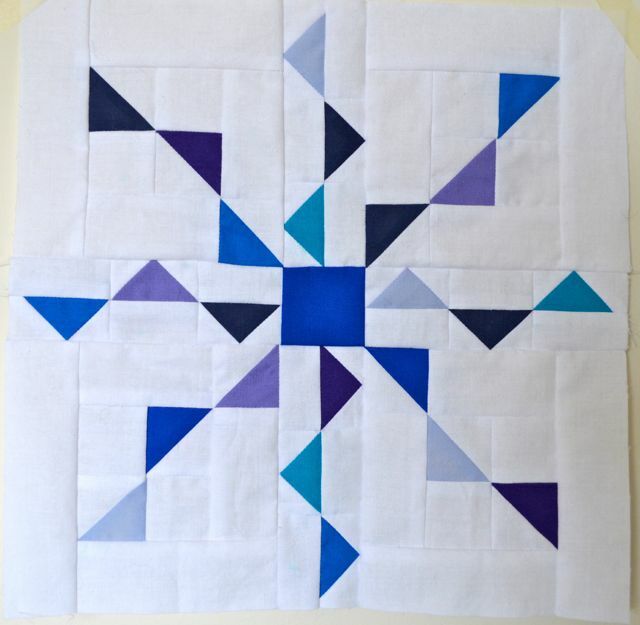 One of the classes I took at the Fat Quarterly Retreat was the Designer Challenge where Katy and John got us to think about shapes and design quilt blocks. 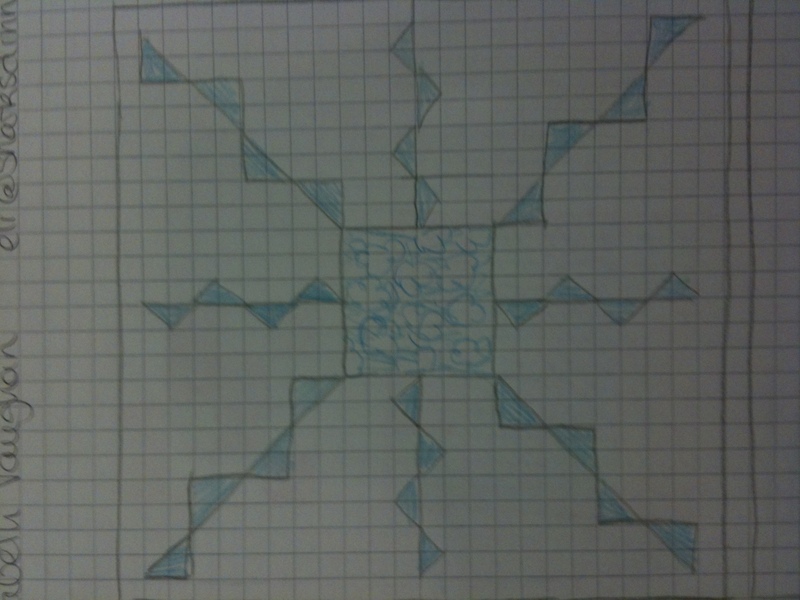 Most of my drawings were just blah but when we had to think about stars I designed a block that I quite liked. When John said he hadn’t seen anything like that before I took a quick picture before handing over my drawings. Back home I couldn’t get my star out of my head and decided to try and sew it up. I sat down, did the math and got it all wrong. When I sewed up the parts that make up the block they ended up way too big. Back to the drawing board…. Do you like it? I love it. It’s not quite like my drawing but I think I actually prefer it like this. There are so many tiny pieces it takes forever to cut them all out but I think that time is worth it. Now, my math still didn’t quite work the way it was supposed to and the block ended being 11″ rather than 12,5″. Mmmh, not sure if I should just leave it at that or try again. This block will be turned into a cushion for a special person. One day I may even go back to it and make a quilt. Would be fun, wouldn’t it? Hello again! I meant to write this post earlier but Little Miss Bossy-Boots was very unwell an didn’t want to leave me for even one second. Poor Little Miss has tonsillitis. She’s getting better but refuses to take the antibiotics the doctor prescribed. Anyway, back to the fantastic adventure the Fat Quarterly Retreat was. Saturday morning I got up and had a lovely breakfast with Amy who I met perchance in the breakfast room. Getting back to my room I was so excited that I went through all my stuff again just to make sure I had everything I needed before making my way to the Baden-Powell House. The Fat Quarterly team were sitting there, greeting us and giving us goodie bags. 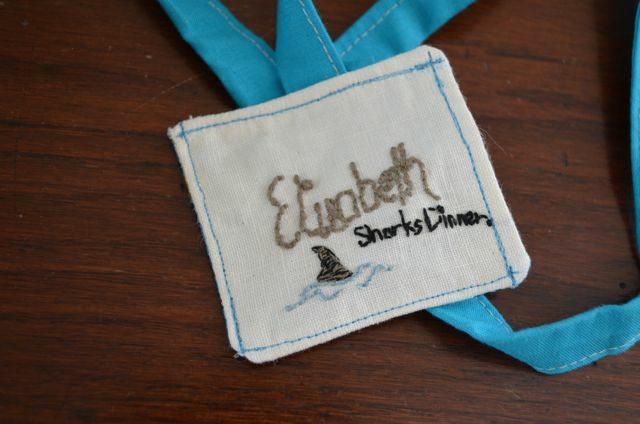 Now, I don’t know if you have noticed that I made a name tag for Annabella for the name tag swap but never showed you the one I received? That’s because I didn’t get mine till Saturday morning and my swap partner was the uber-talented Tacha! Can you imagine how excited I was? Luckily for everyone at the Baden-Powell House I had lost my voice that morning so nobody heard the deafening squeal that was (not) coming out of my mouth. I also got a sticker with my name on and a Bingo card with six names of attendees which I had to find and get to sign my card. Great little ice-breaker. I have to admit that I haven’t looked at that many female chests ever before. I found my six girls in the end but chatted with at least another 5o in the process and got to meet some really lovely people. 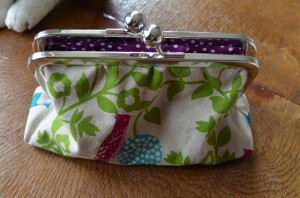 After a nice cup of tea and some biscuits I went to my first class which was frame purses with Katy. The sewing bit went really quickly, Katy explained everything beautifully, and I was very pleased with the look. 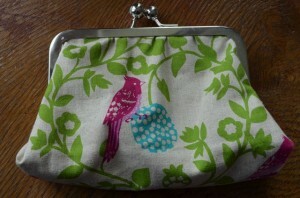 However we didn’t have time to finish off our frame purses as it was time for lunch. Katy told us to grab her after our next class and she would show us how to glue the frame onto the purse. We did and it was really quick and easy although I managed to get mine a bit wonky. No reflection on Katy’s teaching skills but rather on my non-existent multitasking skills as I was trying to glue my frame and sew for the ironman challenge at the same time. After lunch, where I got a platter of food especially prepared for me as I’m garlic and olive oil intolerant (I know, I know. Very sad), I headed upstairs for the sample swap. 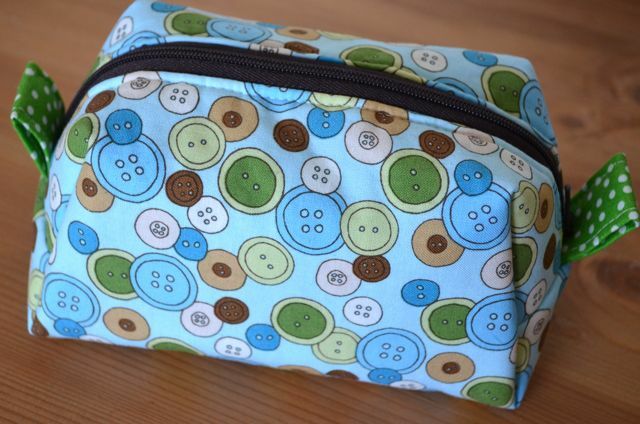 I had seen so many gorgeous things on Flickr and was a bit nervous that my pouches wouldn’t be good enough. 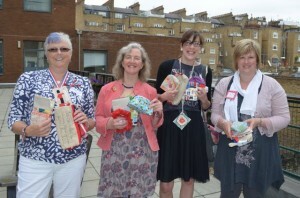 I think they were well received by my swap partners Teresa, Nicky, Emily and Di. I absolutely adore the gifts I received. When I was taking the pictures Charlie insisted on being in it as well. I’m a softie so I let him sit on my sewing table and stay in the picture..
After the swap I grabbed my sewing machine to take Lynne’s class on paper-pieced pillows. I’m a complete beginner and in my ignorance chose the double circle of flying geese which is not a beginner’s piece. With Lynne’s encouragement I went ahead anyway and managed to almost finish one quarter of it. Sorry about the wrinkles; I took the pictures while unpacking. 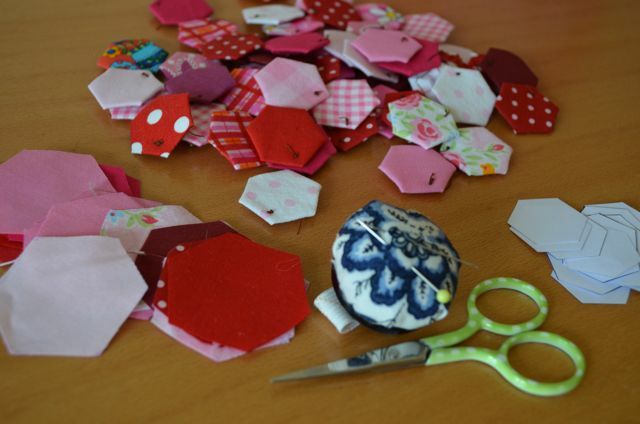 Paper-piecing seems to be like marmite, you either hate it or love it. I loved it although the concentration I had to put in meant I stopped breathing for the entire class. Afterwards I met up with the others from my Ironman group, Amy, Lucy, Muriel, Ruth and Tammy (have I forgotten someone? If I have please forgive me). We got some Savannah Bop by Thomas Knauer to play with. 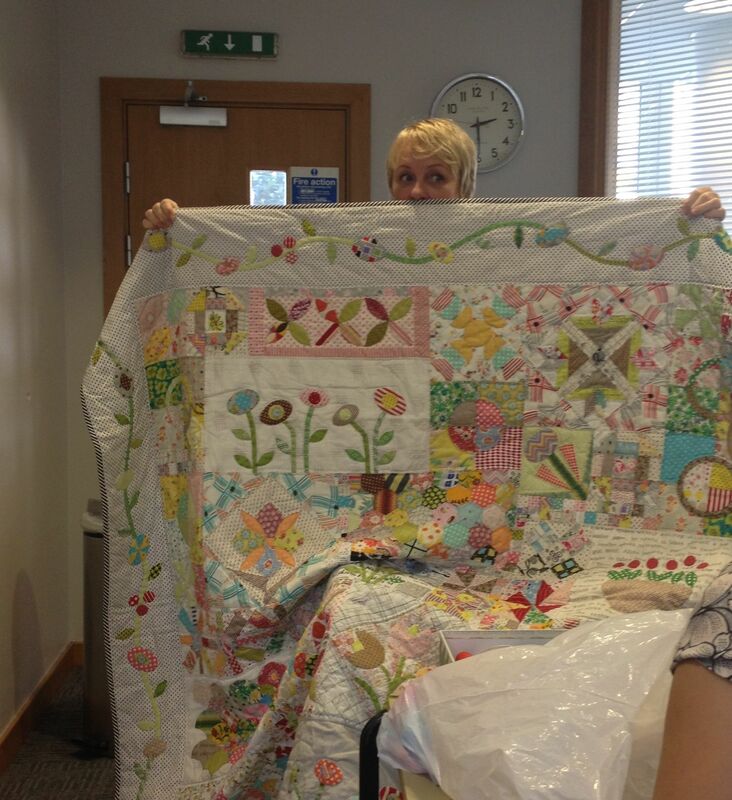 As a novice in quilting I didn’t really say much during the design stage but once the sewing started I did my bit. 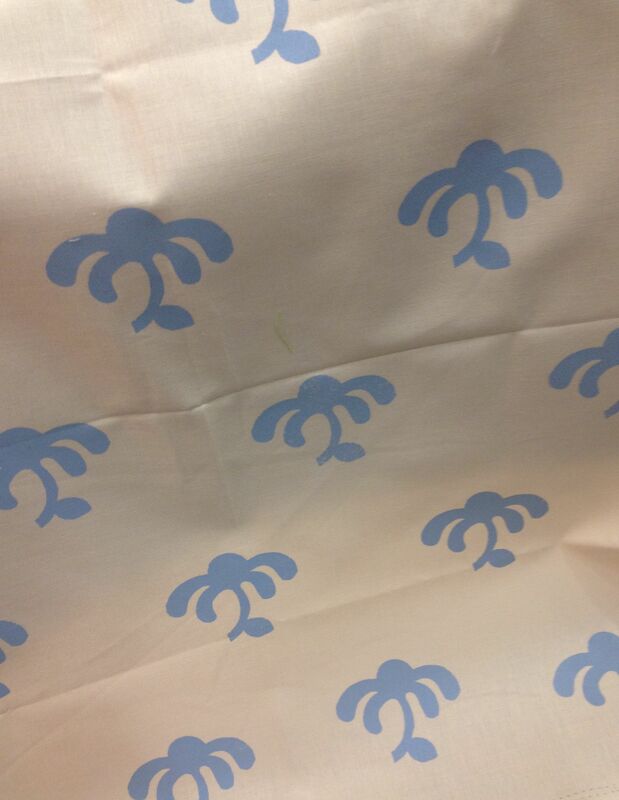 We didn’t manage to finish that night so when I came back Sunday morning I continued sewing on the sashing. I’ll show you the finished quilt top in the next post. Although there was more fun to be had with a pub quiz I had to give up and go to bed. What a fantastic weekend! I really and truly had the time of my life, made some friends and found lots of inspiration. 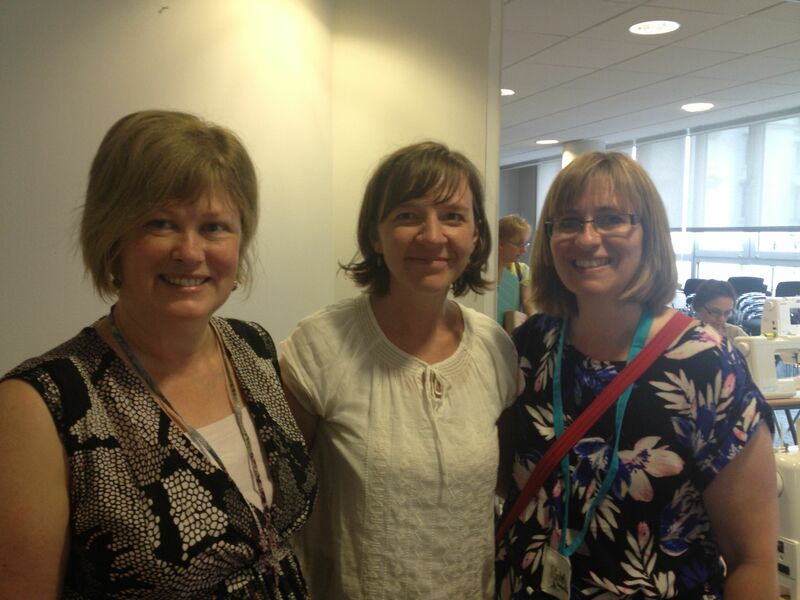 The Fat Quarterly team and teachers did a fabulous job, everything was well organised and so much fun. They made sure that no one sat in the corner by themselves but joined in and had a blast. The classes I took were great and very inspirational. In fact, it’s a shame this week is half term as I’m dying to get behind the sewing machine to finish off my paper pieced cushion cover and make some more portholes. More about those in my next post, though. Now, before I continue I have to admit that I am a bad blogger as I hardly took any pictures at all. I was simply overwhelmed by all the friendliness and was chatting too much (is that possible at a retreat?) and in the process forgot to take the camera out. Friday I hopped on the train to London with my sewing machine on my shopping trolley and three bags. I had already decided to take a cab as I could not imagine dragging my machine up and down stairs to get on the tube. The cab driver almost collapsed when he lifted my Bernina into the cab. She’s a very heavy girl, my dear Wernina (my uncle Werner bought her for my aunt Tania who then gave her to me, hence the name). I think I might have to save up for a lighter machine for the next retreat. 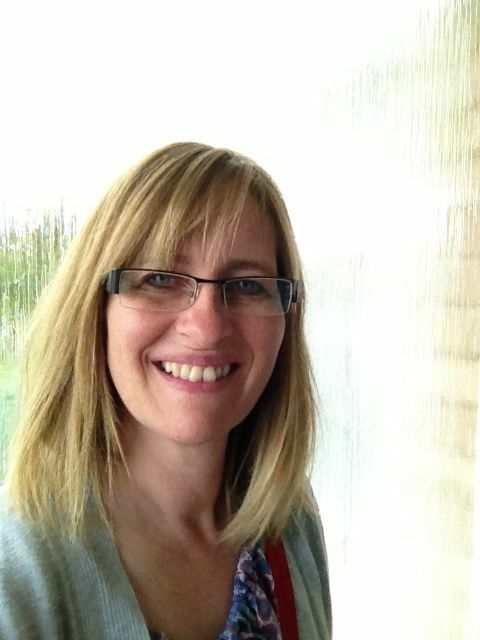 Anyway, I got to the hotel where I met the first two participants, Leanne (She Can Quilt) and Susan (Canadian Abroad). My room was very bijou but equipped with an ironing board, iron and hairdryer. I have no idea where I could have put the ironing board had I wanted to use it but it was a nice thought…. At 5.30pm I made my way to the lobby where a bunch of us was meeting up to go to Tikki Patchwork together. 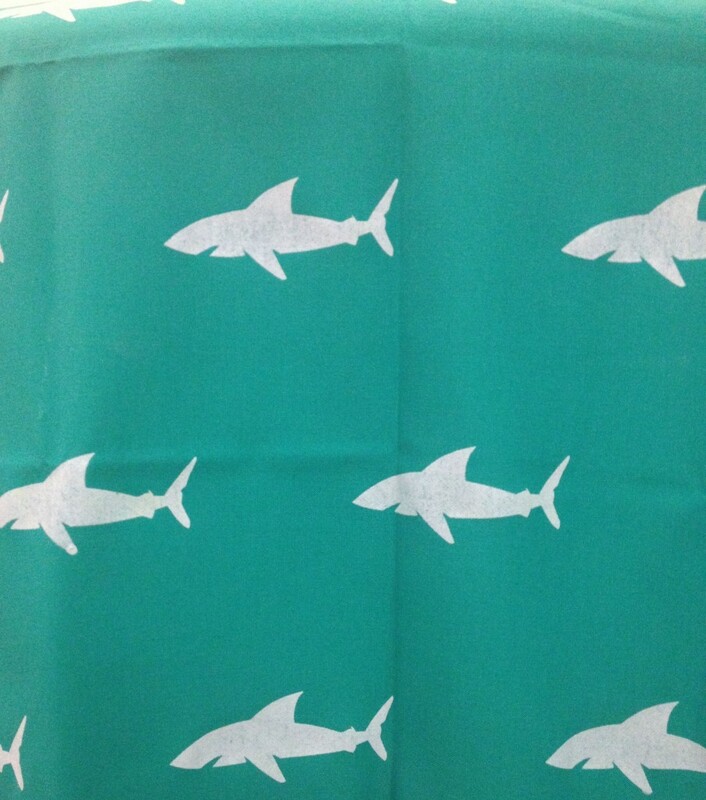 I bought some fabric, of course. 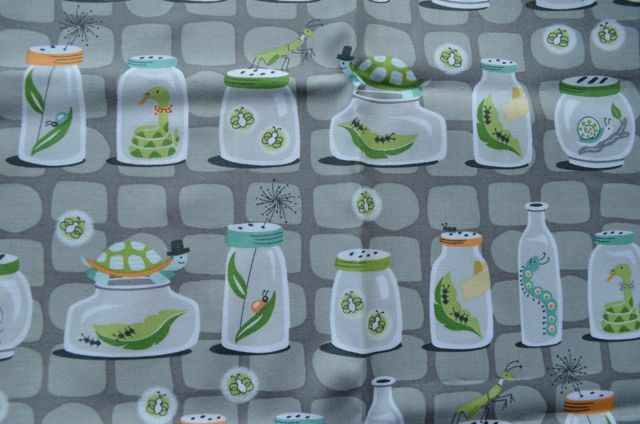 I don’t know who the above fabrics are by but I also bought some Bug Jars from the Backyard Baby Collection by Patty Sloniger for Michael Miller Fabrics. 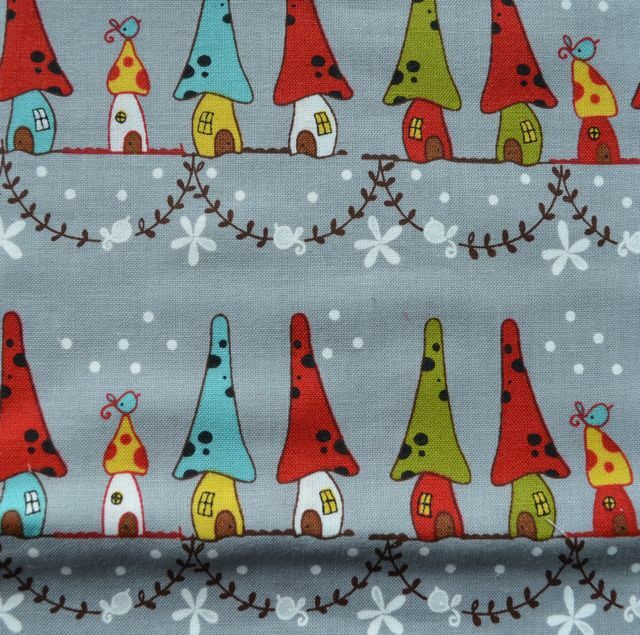 Natalie Lymer’s Woodland also came home with me. 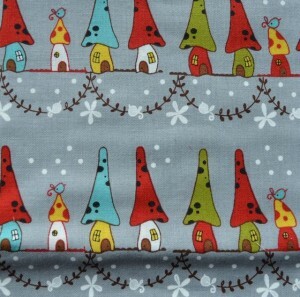 I want to make some Christmas cushions that aren’t too christmassy and I think those little toadstool houses are perfect for this project. After our little shopping trip we all went for a lovely meal before going back to our hotels and rooms to get a good night’s sleep before the start of the retreat. I’ll tell you all about Saturday in my next post. See you then! The Fat Quarterly Sewing Retreat in London is very soon, in fact it’s only ten days away. This has made me panic a bit (this happens to me quite a lot) as I still haven’t got all my supplies or my swap gifts. I signed up for almost everything you could sign up for thinking it would be fun and help me meet lots of people. For the swap we have been put into groups of five which means we bring four gifts (all the same) and get four gifts (all different). How cool is that? I’ve seen a few of the things people are bringing in the Flickr group pool and with every new picture popping up I hope that I will be in that person’s group. The stuff people have been making is fabulous! 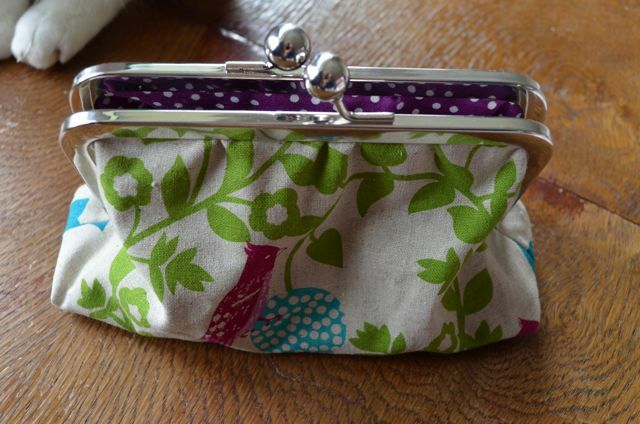 For ages I couldn’t decide on what to make for the swap but on Monday it finally hit me: The sugar loaf pouch. 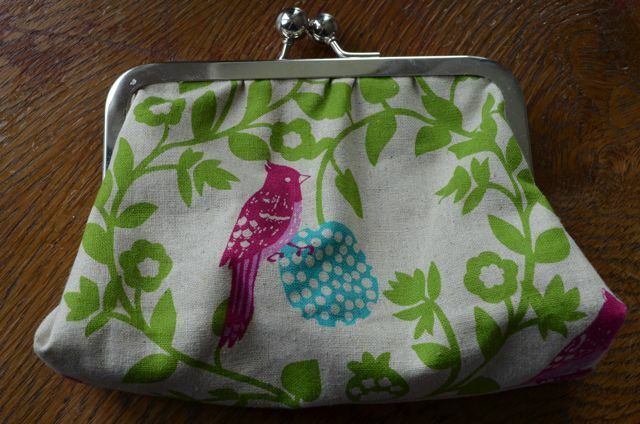 The pattern is by the lovely Lisa Lam from U-handbag and I bought it ages ago. 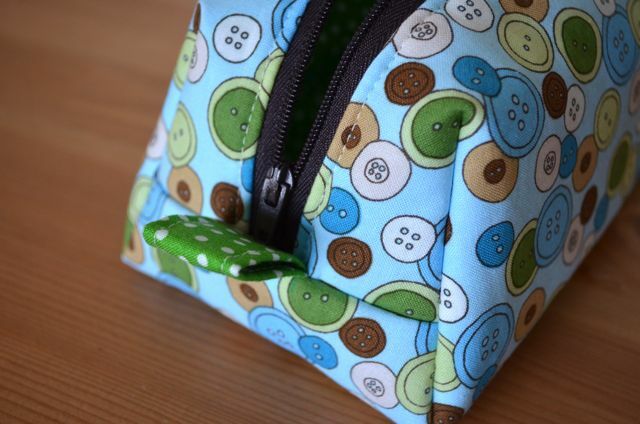 Then it just sat there and from time to time I looked at it and thought “I have to make one of these pouches, they’re s cute”. Now I can add “and so addictive”. 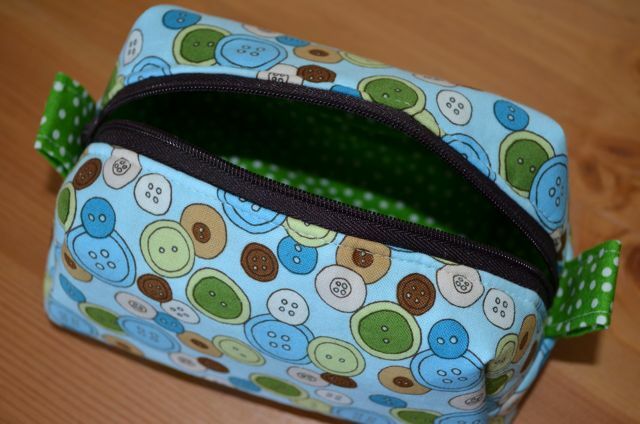 I love them and they are so handy, just big enough for a phone and some other bits and bobs or sewing supplies or medicines and plasters or…. Will I be able to stop after four, the number of gifts I need to bring? Watch this spot! PS Did you notice I didn’t put any metal hook snaps on my pouch? Well, I only had three at hand so I left them off completely. I just couldn’t wait…. Despite being in bed most of the week with fever, nausea and diarrhoea I managed to finish the name tag for the Fat Quarterly Sewing Retreat! Funnily enough it looks nothing like I imagined when I first squiggled down some ideas. I’m happy with it and I just hope my partner will like it too. 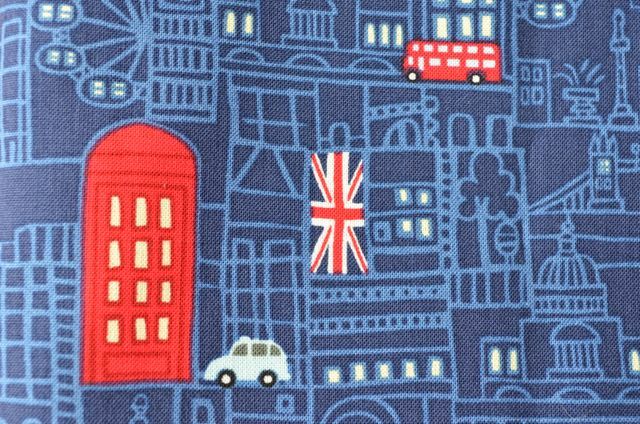 I fussy cut a double decker bus, London cab and Union Jack from the “Cool Britannia” fabric that I bought especially for the retreat (I ordered mine from Claire at Patch Fabrics if you’re looking for it). 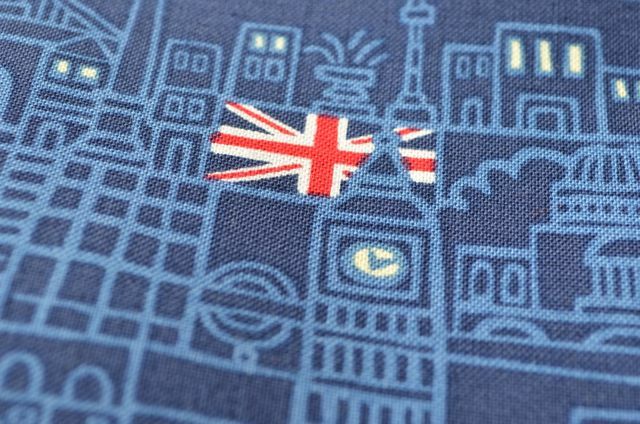 Add to this a bit of linen and a crisp candy stripe and you have a combination that looks rather nice and very british. Are you wondering where the name is? Well, as it’s a secret swap I can’t show it yet but I can tell you that it’s embroidered in a dark blue stem stitch. 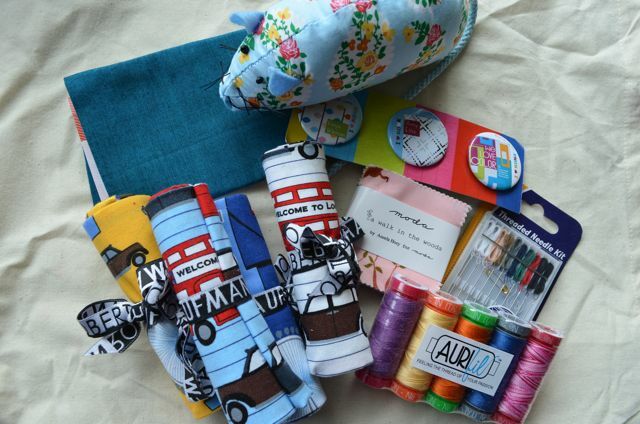 I couldn’t stop, though, as I really loved the combination of the three fabrics and made a pin cushion and zippered pouch as well. It’s a good thing I had to go and get Little Miss Bossy-Boots or there’s no telling what I would have sewn next. Hope you have a lovelier weekend than us; it’s raining cats and dogs here. Hello! nice to see you here again. We’re back from our trip to Ireland which I have thoroughly enjoyed. It was incredibly relaxing with Grandma and Grandpa entertaining Little Miss Bossy-Boots most of the day. It gave me some time to do things on my own or with Master. We even managed to have a lovely anniversary lunch (7 years last Sunday) with some friends in Kelly’s Bar in Galway. 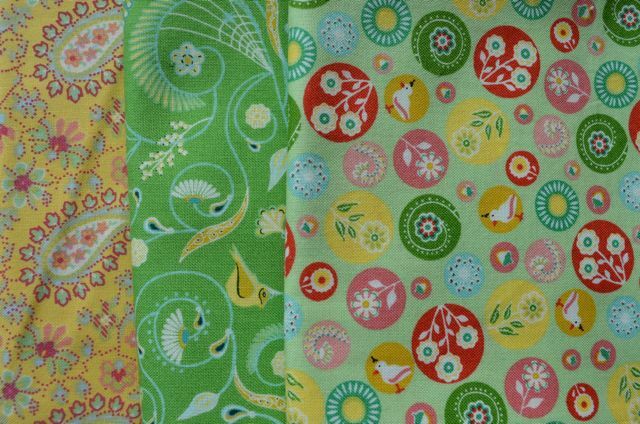 We ambled through a tiny market in Galway where I bought some Echino and Far Far Away III fat quarters and just generally enjoyed some quiet time. 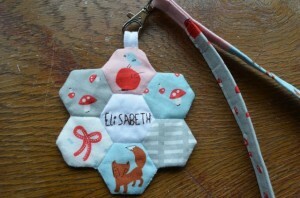 I also found the time to work on my hexagons in peace and quiet. “Hexagons? I thought you said you were going to do octagons?” I hear you say. Yes, that was the plan but I changed it at the last minute. The week before Easter my friends Nicola and Vicki came over and we made five heart pillows. 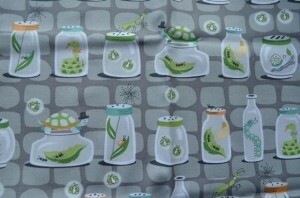 It made me realise that we have to somehow find the money to buy lovely fabrics to make them with. So far we have been using fabrics that we’ve had lying around and some stuffing that I bought for the first heart pillow I made. It’s ok for now but I really think that we need some cash to be able to buy materials such as bags to put the pillows in and cards to wish the women the strength to fight. I’ve decided to make a hexagon cushion in pinks and reds which I will donate for a raffle. I might find some more things to give away if I have a good look but I thought this might be a start. Anyway, Ireland was lovely and we were even lucky with the weather. 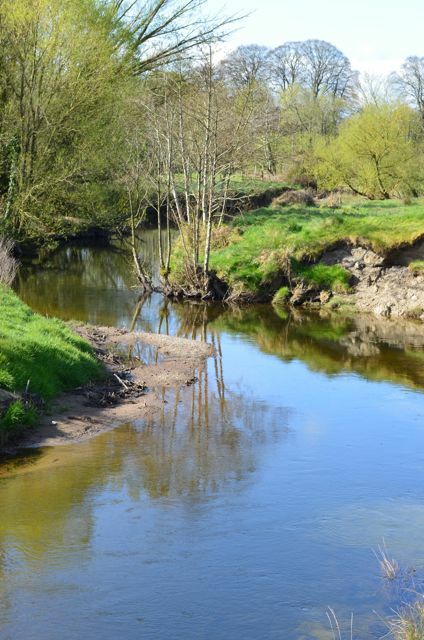 As an added bonus we were allowed to bring the dog and I very much enjoyed walking him along the river in Birr. One day we even found a friend for him. 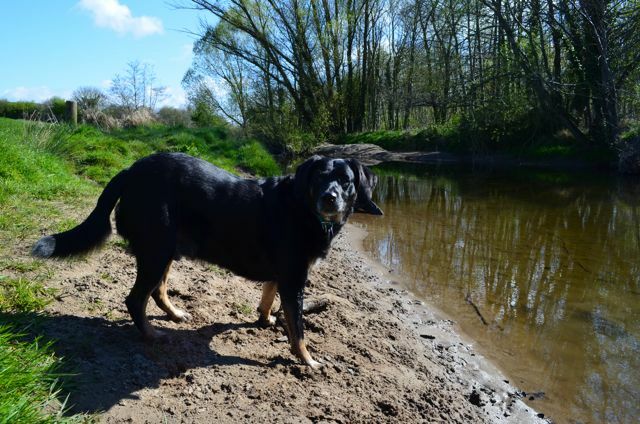 Although all dogs are supposed to be on a lead there are quite a few dogs that roam freely. One day on our way down to the river we met a gorgeous white dog who followed us on most of our walk before going back home. It was lovely to watch the dogs running around and playing. They chased each other into the river and all around the field. Pure joy! Sadly we had to return two days early as Master had to attend an important meeting at work. 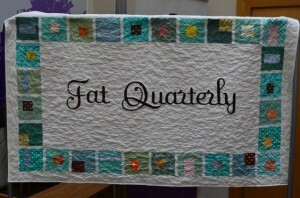 Now that I’m back I want to make my partner’s name tag for the Fat Quarterly Sewing Retreat. I’ve had a great idea for it but I’m not sure that I can pull it off. I will have a go and if it doesn’t work out I’ll have to put my thinking cap back on. Pressure is on as I’ve seen a few name tags in the Flickr pool and they are gorgeous. On top of that the shipping date is the beginning of May so I really have to get a move on. Well, not quite yet but soon. 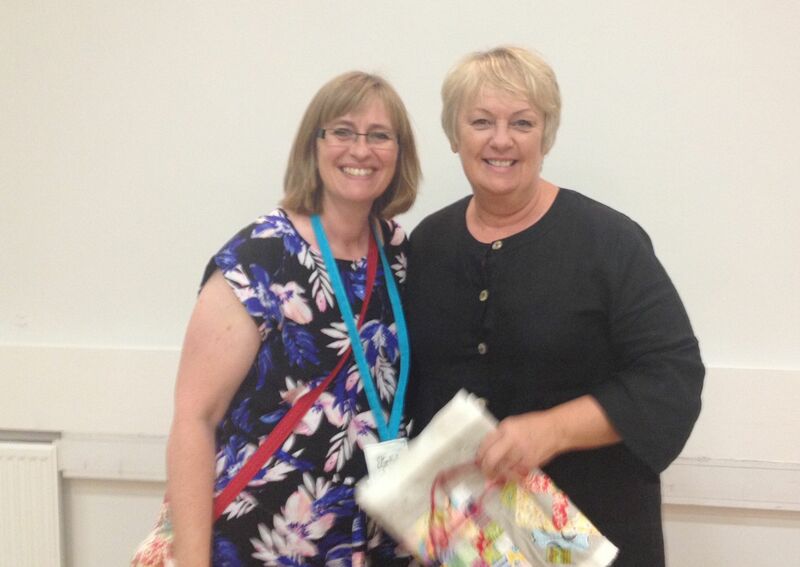 I bought a ticket for the Fat Quarterly Sewing Retreat which takes place in June. I’m so excited about it I could do a silly dance but that would just embarrass my family. Although I’ve known for ages that I’m going it sort of hasn’t sunk in properly until now. 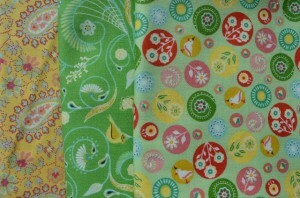 I’ve entered all sorts of fun swaps and the fabric you see above and below was bought with that in mind. 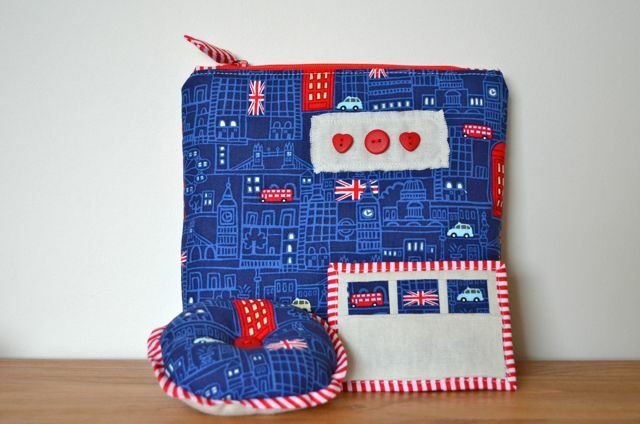 It’s “Cool Britannia” for Benartex and I love the little London cabs and double decker busses. The sewing will have to wait till we get back from Ireland, though, as my neck still can’t take the position I’m in when I’m sewing.